In the Shibuya section of Tokyo, Henn na cafe, a robot coffee shop, features a machine (made by the US manufacturer Rethink Robotics) with a robotic arm, automatic coffee maker, and screen displaying an avatar’s face. It greets visitors in Japanese. “Hello, would you like delicious coffee?” it says. The robot will then scan the QR code of the ticket to serve them. 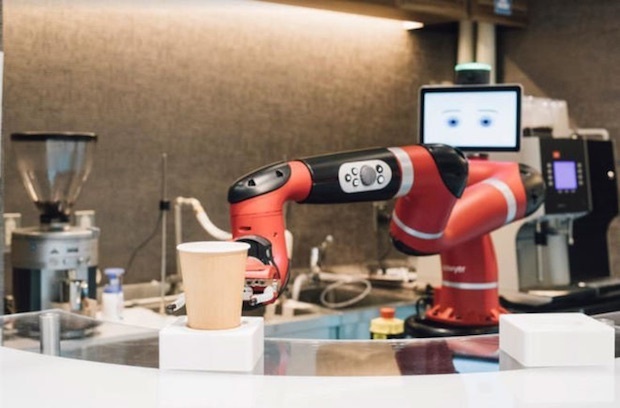 It grabs a paper cup and moves it toward the coffee machine before pouring grinded coffee beans into the machine and pressing a button to make the drink. When it is ready, the robot places it at a reception counter.